Puzzled by past tenses? Confused by comparatives? This clearly structured and beautifully presented workbook is packed with grammar practice activities that make learning English grammar incredibly easy. The English for Everyone Grammar Guide Practice Book is an essential companion to the English for Everyone Grammar Guide, a comprehensive reference book that makes even the trickiest grammar rules clear and simple. The Practice Book mirrors the unit-by-unit structure of the Grammar Guide. Each Practice Book unit is full of carefully graded grammar exercises to drill and reinforce the grammar you have learned in the corresponding Grammar Guide unit. These exercises will help you build up your confidence and become more fluent, giving you the chance to practice using the most important English grammar constructions again and again. 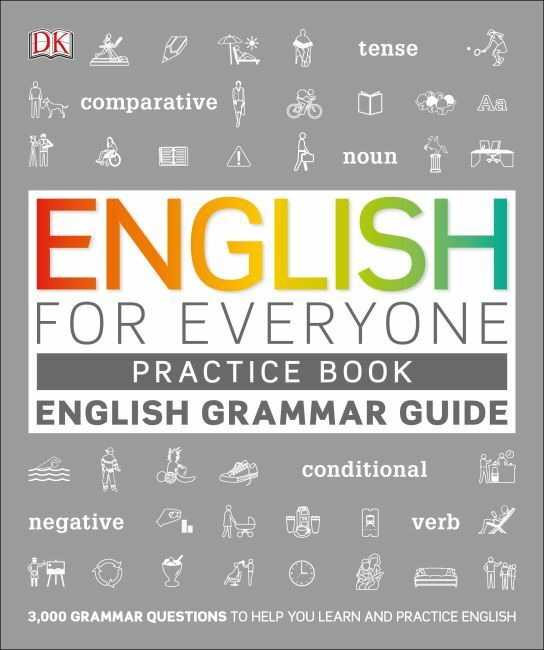 Ideal for students at all levels, the English for Everyone Grammar Guide Practice Book covers basic, intermediate, and advanced English grammar in one easy-to-navigate book. Like all books in the innovative English for Everyone series, it uses a visual learning method: many of the exercises are accompanied by attractive illustrations that put grammar practice points into context and give you visual cues to help you understand the exercises. Whether you want to improve your grammar for work, study, travel, or exams, the English for Everyone Grammar Guide Practice Book offers you a simple way to learn English grammar, remember it, and use it with confidence.